In preparation for the Thanksgiving holiday, I have been testing some turkey breast recipes from Food Network’s website. Earlier today I posted a review of a Guy Fieri recipe. 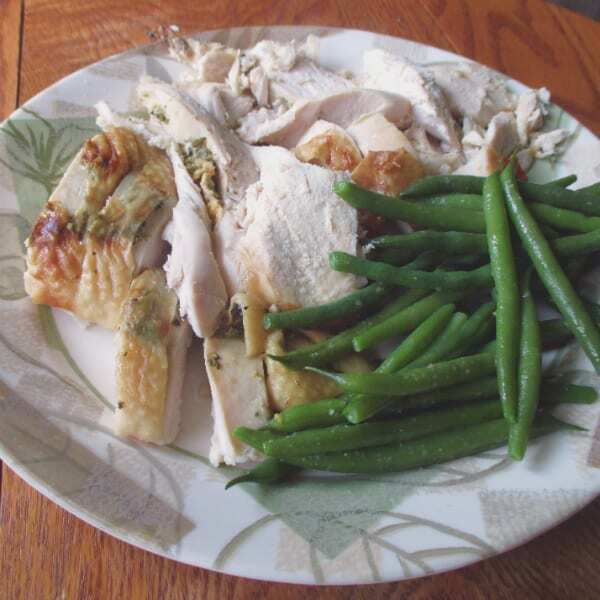 The other one I tried out was Ina Garten’s (the Barefoot Contessa) Herb-Roasted Turkey Breast. This a simple turkey breast that is easy to make without too much fuss. It does not just a brine, just some seasoning directly on the meat right before cooking. Click here to find the full recipe on Food Network’s website. 1. Usually I start in a blazing hot oven and then reduce the temperature. I decided to follow her instructions and go with the lower temperature of 325 for the duration of the cooking. And turned out perfectly fine. 2. I usually all the ingredients with exception of the white wine in the bottom of the roasting pan. She uses the wine to mix with the pan juices to ladle over the turkey when served. My turkey breast was plenty moist, so it is necessary, but if you want that extra flavor by all means go ahead. 3. I am glad that she calls for you to put the seasonings directly on the meat underneath the skin. I don’t usually eat the skin, so the flavor is going directly on what I do eat. If you look at the picture above you can see the herb mixture underneath the skin. Gets your mouth watering, huh? 4. I like the addition of ground mustard to the herb paste. It’s doesn’t stand out but just adds another dimension of flavor. I always have it on hand to add to my macaroni & cheese. 5. One thing I do not understand if all these Food Network chef (Guy said the same thing) say check the turkey with an instant read thermometer. This is the perfect reason to use a probe thermometer. Alton Brown has been recommending it for years. No having to try to position an instant read and then leaving a hole in the meat for liquids to drain out. A probe stays in there until after the meat has rested, so not juices will flow out. Also when you use an instant read you are opening the oven, decreasing the temperature and increasing the cooking time. This turkey breast was amazing. I hit the perfect temperature of 165. The meat was very moist. I usually brine my turkey and this was just as moist. The only difference with the brine was the flavor of the brine was found in every bite of meat. The flavor of the herb mixture is just on the outside of the meat, so you need to cut it on a diagonal to get a taste in each slice. I made this twice and both times came out equally as good. 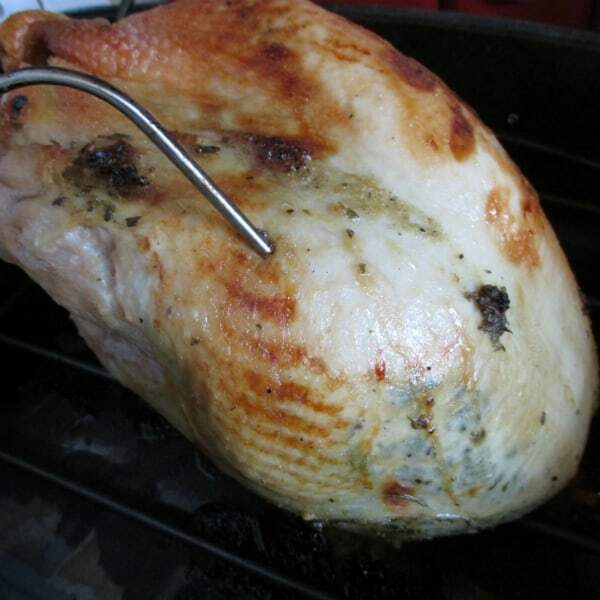 It’s an easy to make turkey breast for those going for just white meat this Thanksgiving.